He was born in the mountains, up in the northern Indian state of Jammu and Kashmir, where the air was then still fresh and the trees were green. Up there, in the small, remote village of Ulaytokpo in Ladakh, Sonam Wangchuk went to school with other tribal children. Education was difficult, he recalled, because minorities were discriminated against, and schools were lacking and poorly-equipped. Teaching standards were abysmal during those days and what was written in textbooks was irrelevant to the lives of mountain people. "I had a very rough education in the mountains," Wangchuk told ucanews.com during an interview in Manila. "Not much with what you got from the textbooks made sense," he said. He was then too young to understand, but when he got older and was confronted with financial difficulties to continue his own education, he opened his eyes. "I had to teach other students to support myself," he said. There, in the cold desert region where some 300,000 people struggle in the midst of a harsh environment and conflict, Wangchuk took control of his life. Amid the people's struggle for autonomy, the young man, inspired by the creativity and the will of the people to empower themselves, started his life's journey. "During the course of time, I saw and understood the problems," he said, adding he saw how and why young people like him were made to feel like failures in life. Wangchuk said the education system, which was copied from the cities and from more advance economies, "was so irrelevant, especially for people in the mountains." "It did not make much sense, even to people in New Delhi, and even in London," he said with a smile. He was a 19-year old engineering student at the National Institute of Technology in Srinagar, Kashmir, when he went into tutoring to finance his schooling. Renting a hotel function room, he advertised a coaching program that, exceeding expectations, drew close to a hundred students. He taught subjects like English and Maths, using strategies like peer-to-peer teaching. It was a financial success for Wangchuk, but it also reinforced his experience of how poorly educated children from village schools were. After earning an engineering degree in 1988, Wangchuk founded the Students' Education and Cultural Movement of Ladakh. He introduced a coaching program for students, 95 percent of whom used to fail government tests. He partnered with local government units in a joint program of educational reform, which started in a village school. The program involved training teachers in "creative, child-friendly and activity-based" education, including the introduction of subjects relevant to the local culture and context. Village education committees were also organized to support schools, monitor teacher performance, and help everyone become education stakeholders. The initiative of "localizing schools" was later replicated in 33 schools and became a veritable movement. In 1994, Wangchuk led "Operation New Hope," which aimed to expand and consolidate the "partnership-driven" educational reform program in the region. To date the program has trained 700 teachers, 1,000 leaders of village education committees, and increased the success rate of students in government exams from five percent in 1996 to 75 percent in 2015. "It is not easy to change the system, we were powerless, helpless young people when we started," said Wangchuk. Instead of criticizing the government's inadequacy, he decided "to be tactful and go with the system and change it from within." When 30 villages were involved, then another 30 schools, and about 30,000 people, "that's when we went to the government and convinced it to change the system." "We never aimed at changing the whole of India. What we wanted was to bring some changes in our region," he said. Wangchuk believes in working out of one's local experience. Seeing how climate change has affected the natural water supply for agriculture, he seized on the idea of building artificial glaciers in the form of "ice stupas" for irrigation during the dry summer. Called "stupas" (for public appeal in a Buddhist land), these are conically-shaped ice mountains that store water in winter and in summer melt to supply farm irrigation water. Beyond Ladakh, he shared his environmental and educational innovations with mountain peoples across the whole Himalayan belt, and as far as Switzerland. Watch Sonam Wangchuk being interviewed in this ucanews.com video. The 51-year-old Ladakhi engineer, innovator, and education reformist said that while the world comes up with Version 2 of everything, from education to software and technology, there is also a need to come up with "Religion 2.0 or God 2.0." 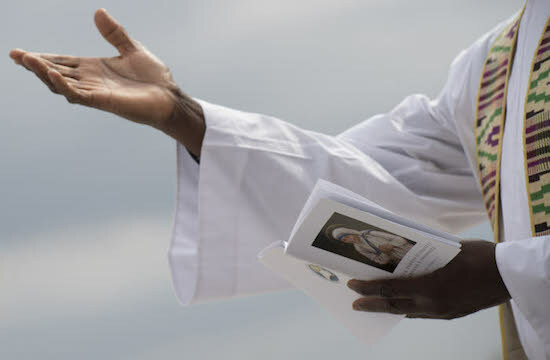 He stressed the need for spiritual and religious leaders who should preach about "a new form of non-violence and peace with air, water and all living beings on this planet." "We need to update our religion," Wangchuk told ucanews.com. "Our religion is somewhat outdated from the time when people were killing with guns and daggers, our leaders are still talking about peace of that kind whereas the current problem is not the peace of guns and daggers," he said. Wangchuk said the "main causes of violence and deaths these days are environmental in nature [and] lifestyle related." He said he looks forward to "new ways of seeing religion" where Hindus and Muslims, for instance, would not only say that they would not eat this or that kind of meat but would say that "we don't use plastic bottles, we don't use cars for no reason, we use public transport, we use steps rather than escalators." "The challenge for people these days is to rise to a new form of realization, religion and faith, whereby all these things that have come up in the last five decades are incorporated and we see life in a slightly new way," according to Wangchuk. 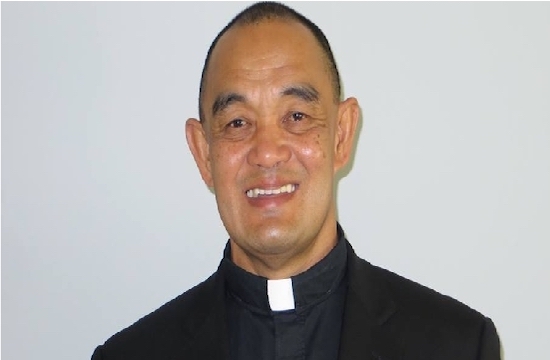 He lauded Pope Francis for speaking about the environment in the encyclical Laudato Si’ because it is "the need of the hour." "In Asia, we talk of non-violence ... yet today's modern world has become so violent.... We're killing our grandmothers and grandfathers with air that is so polluted," he said, describing it as "the biggest form of violence in history." 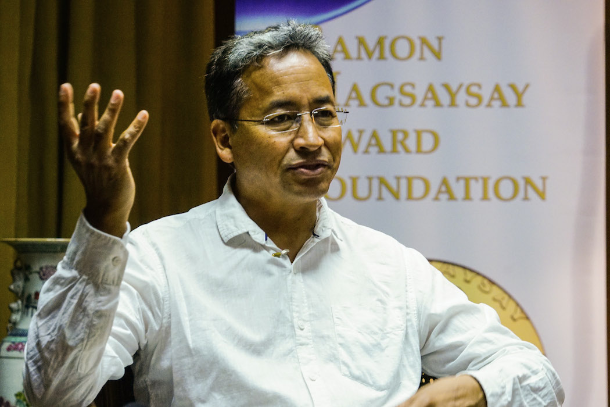 For "his uniquely systematic, collaborative and community-driven reform of learning systems in remote northern India," Wangchuk has been awarded a 2018 Ramon Magsaysay Award, Asia's equivalent to the Nobel Prize. His "constructive engagement of all sectors in local society to harness science and culture creatively for economic progress" is also cited for "setting an example for minority peoples in the world."